The Mid-Atlantic Road Racing Series (MARRS) held its ninth regional SCCA Club Racing event of the 2012 season on Saturday August 4th and Sunday August 5th at Nelson Ledges Road Course in Garrettsville, OH. As with the previous previous MARRS 8 race, Larry, Bob and Ted Cahall all practiced on Friday for the second time this year. For the actual races, Ted again ran in three classes: SM, SM5, and STL. Bob and Larry each ran in the SM and STL classes. The run group order for this weekend was: SM5, STL, and then SM. In the Saturday Qualifying Races, for SM5, Ted took 2nd place behind Mike Collins. For STL, Ted took 1st, Bob 2nd, and Larry 3rd. In the Saturday SM race, Ted managed to get around Forrest Landy and finished 8th while Larry finished 10th and Bob 11th. Ted set a new personal best in an SM car at Nelson Ledges with a 1:19.45 lap. On Sunday, in SM5, Ted again took a podium finish with his first ever win in SM5 (Mike blew his motor and did not race). Ted also won the rain shortened STL race while Bob took 2nd and Larry 3rd. For SM, also in the rain but with all laps completed, Ted bobbled and let Forrest get by him. Within two laps (click to see video) he had passed Forrest back and finished 7th, his best SM finishing position of 2012. Bob finished 9th and Larry 10th. This is the first time all Cahall brothers finished in the top 10 of a MARRS SM race. On Ted's way to the airport and Bob's drive home, Ted and Bob stopped at Holy Cross Cemetery in Cleveland, OH and paid their respects to their parents that passed away in September of 1994 and 1995. 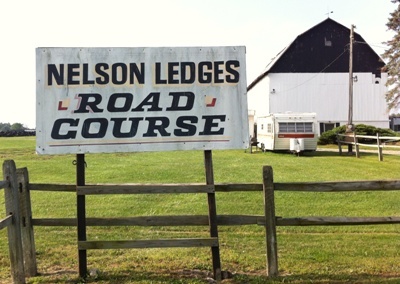 It is nice to race in Ohio near their birthplace and parents' final resting place.